Designed and produced with engineering and finishing advancements, CompStar high performance connecting rods have what it takes to make your engine build trouble free and your finished product reliable. Every detail of this highly-stressed component has been carefully analyzed to maximize repeatability and dependability. 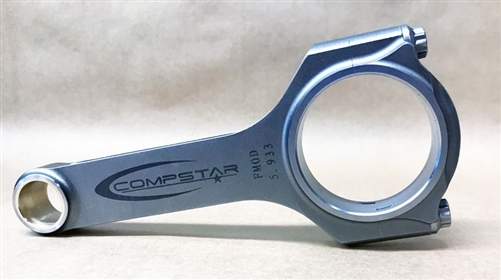 Based on feedback from a variety of highly regarded professional engine builders, Compstar engineers set out to address the most common issues associated with many aftermarket connecting rods. Out of round, and repeatability are certainly a major concern for all engine builders. 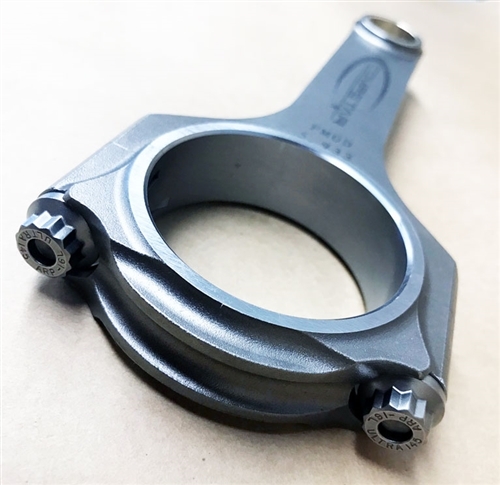 Many connecting rods are dimensionally well within industry standards out of the box, but after disassembly and reassembly become out of round. Compstar rods maintain dimensional repeatability through use of a lengthy stress relief process, and multiple re-torque processing. The combination of the release of residual machining stresses and burnishing of threads and bolt spot faces ensures that big end bores stay round regardless of how many times your rods are disassembled and reassembled. Properly detailing connecting rods in preparation for use is a time consuming task. 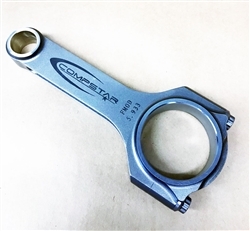 Compstar connecting rods have the most common prep work already done. Pin bushings are chamfered and honed for proper high performance oil clearance. Parting line edges are generously chamfered to resist scraping during insertion of the bearing shells. The bearing locating tab slots are de-burred to ensure the bearing tab is fully seated for trouble free installation. Compstar rods were designed with higher horsepower stroker motors in mind from the start, not as an afterthought. Bolt upgrades and stroker clearance are normally additional cost options with other rods, but are standard equipment with Compstar rods. ARP 2000 bolts are used exclusively for superior tensile strength and clamping force at the critical mating joint of the rod and cap. The placement of these bolts is also key to additional rotational clearance in stroker applications at the bottom of the bores and at the pan rails. Strengthening gussets are also added to the bolt spot-face area of the cap where cross sectional thickness is at a minimum. These gussets not only increase strength, but aid in dimensional stability as well. Contouring above the bolts increase cam clearance and decrease the amount of clearance required at the bottom of the bores on the cam side. The increasingly popular Forged Side Relief style pistons move the pin bosses inward, normally requiring narrowing of the pin end of the connecting rod. Compstar rods are designed and manufactured with a .960″ pin end width, and will work with all currently available FSR style pistons without modification. The Compstar engineering staff has worked very hard at reducing weight without sacrificing strength and durability. 3D solid modeling software has enabled us to refine our design while monitoring predicted weight, resulting in a very high strength to weight ratio. Wiseco BoostLine Connecting Rods 4.6 5.0 5.933"